This is my 100th post! At this juncture, I wish to thank the readers and friends for the support and encouragement extended to me, without which I could not have managed 100 posts in a span of less than two months. My main goal of starting this site was to document my grandma's recipes for posterity. However, I expanded the scope of this blog to include other sections on art, creative writing, musings and health. I hope that you find this blog's content useful. Your feedback and comments are greatly appreciated. I seek your continued support, which keeps me motivated. Thank you once again! Aval/ Flattened rice/ Poha is rice that is de-husked and flattened. Aval is used to make snacks, and can also be eaten with milk and sugar. 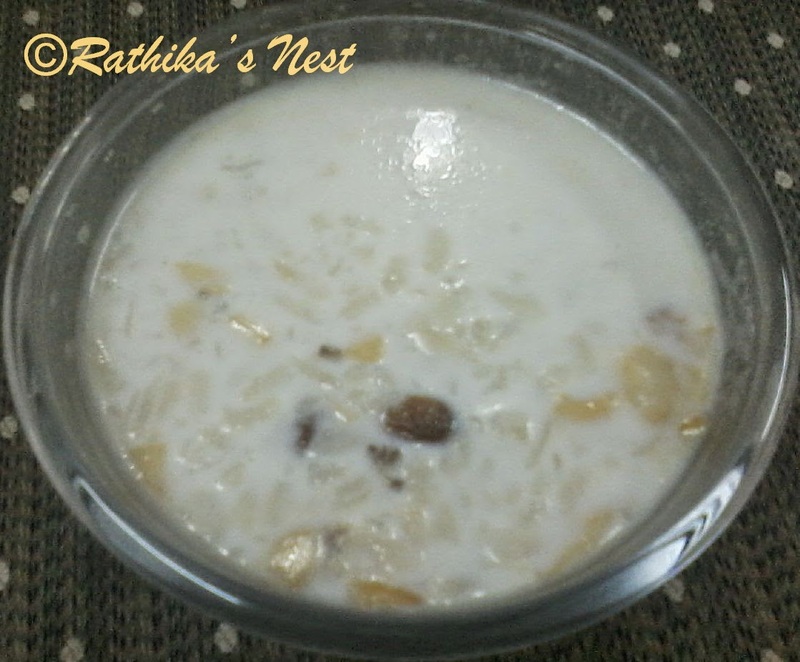 Aval payasam is a traditional preparation that has a specific taste. Method: Fry flattened rice or aval in 2 teaspoons of ghee till it turns light brown in color. Allow it to cool. Break it slightly using a ladle (ஒன்று இரண்டாக உடைத்துக் கொள்ளவும்) or a pestle. Add 1 tumbler (200ml) of water. Cover and cook on a slow flame till the aval is cooked well and has become really soft. Add milk and bring it to boil. Switch off the fire. Add sugar and mix well. Powder cardamom seeds and clove. Crush camphor laurel with your fingers. Add spice powders to the payasam and mix well. Heat the remaining ghee in a spice pan/ tadka pan (தாளிக்கிற கரண்டி). Fry cashew nuts and raisins till the nuts turn light brown in color. Switch off the fire. Add the fried items to the payasam. Serve hot.